The RAAF says it is gradually returning its PC-9/A turboprop trainer fleet to flying status as the aircraft undergo inspections following the discovery of cracking in the folding strut of the aircraft’s nose landing gear. “The PC-9/A fleet is being progressively reviewed and returned to flying. 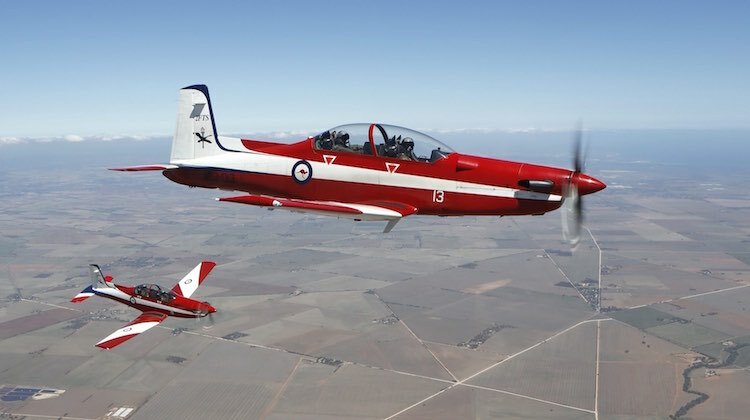 There are now over 20 aircraft flying across all Air Force PC-9/A squadrons/schools,” a RAAF spokesperson told Australian Aviation via email on Friday. Defence announced on May 19 that cracking had been discovered and “as a precautionary measure”, each PC-9 would “undergo an additional engineering review, and remediation repairs, before returning to normal flying activities”. Meanwhile, assessment of the damage to a RAAF C-27J Spartan involved in the landing incident at Waco, Texas on May 18 is continuing. “The C-27J Spartan is currently being assessed for repairs, which will determine the timeframes for return to flying. The safety investigation is also continuing,” the RAAF spokesperson said. The aircraft blew two tyres in the incident, which took place during a night time pilot training flight, causing the temporary closure of the airport while the aircraft was inspected and removed from the runway. One C-27J has suffered some damage in a heavy landing, the rest of the fleet is fine.